Watch Dunya TV Hasb-E-Haal Latest Episode 10th January 2015, Azizi as Palmist BM Anjum, Discussion on different news, discussion on the effects on Pakistan after decreased petroleum products, discussion on bad habits and the interview of Palmist BM Anjum azizi. Hasb-e-Haal is the infotainment program broadcast by Dunya TV Pakistan which is widely watched in local and international community of Pakistani's. 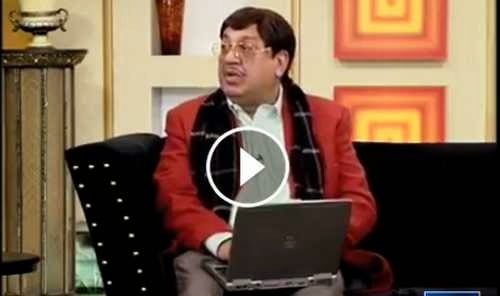 Watch Hasb-e-Haal with Najia Baig, Sohail Ahmed as Azizi and Junaid Saleem.